Schedules for the annual award ceremonies hosted by major television networks remain murky this year in the aftermath of major broadcasting union strikes, which lasted from September until last week. Only SBS, which was not affected by the strikes, has confirmed that it will host the SBS Entertainment Awards on Dec. 30 and the SBS Drama Awards on Dec. 31. The SBS Gayo Daejeon, a major end-of-the-year music program, will take place on Dec. 25. Planning for the events is in full swing at SBS, according to reports. At MBC, though the 73-day strike ended on Nov. 15 with the removal of former president Kim Jang-kyom, the broadcaster had originally planned to forgo the yearend award ceremonies this year. 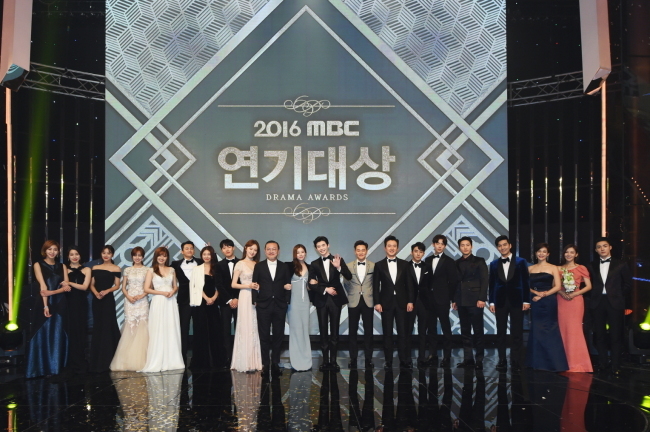 After some last-minute discussions, however, MBC is considering whether to host the MBC Entertainment Awards on Dec. 29 and the MBC Drama Awards on Dec. 30. The MBC Gayo Daejejeon is confirmed to take place on Dec. 31. At KBS, where union members went on strike from Sept. 7 to Nov. 10, the KBS Drama Awards will take place on Dec. 31. The dates for the KBS Entertainment Awards and KBS Song Festival, meanwhile, remain unclear.